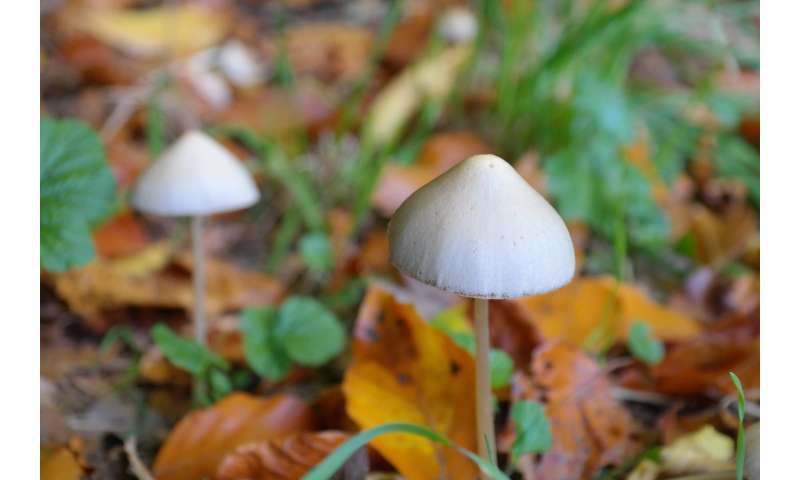 A team of researchers at Friedrich Schiller University Jena has figured how out to make psilocybin, the chemical responsible for creating hallucinations in people who consume the mushrooms that produce it naturally. In their paper published in the journal Angewandte Chemie the team describes isolating the enzymes needed to create the chemical, developing the recipe and creating psilocybin samples in their lab. People have known of the hallucinogenic effects of eating certain "magic mushrooms" for hundreds or even thousands of years. But it took Albert Hofman's efforts to isolate the psychoactive ingredients in 1958. Since that time, many scientists have tried to figure out how, exactly, mushrooms make psilocybin so that it can be artificially synthesized and sold as a medicinal drug. Attempts have failed until now. Notably, growing magic mushrooms for commercial use has proven difficult due to the unique attributes of the mushrooms. To learn how mushrooms naturally create psilocybin, the researchers sequenced the genomes of two of the main types of magic mushrooms—that allowed them to isolate the genes that were responsible for producing the enzymes that lead to the creation of psilocybin. Next, they engineered fungi and bacteria samples to confirm their initial findings and to learn of the order in which the synthesis took place. As it turned out, there were four enzymes involved in the process, but after more study, the researchers found that only three of them (PsiD, PsiK, and PsiM) were needed to make the chemical in the lab. Using this information, the researchers developed a "one pot reaction" recipe for creating psilocybin on demand, utilizing the enzymes they had isolated. They then created samples of psilocybin in their lab—the first team ever to do so. Their efforts may pave the way for commercial production of psilocybin as a pharmaceutical drug for use in treating brain ailments such as depression or anxiety, or even for smoking cessation.